I write to share some sunshine and an update on how the Syrian New Scots are fairing. Last week saw part two of the radio drama workshop complete. 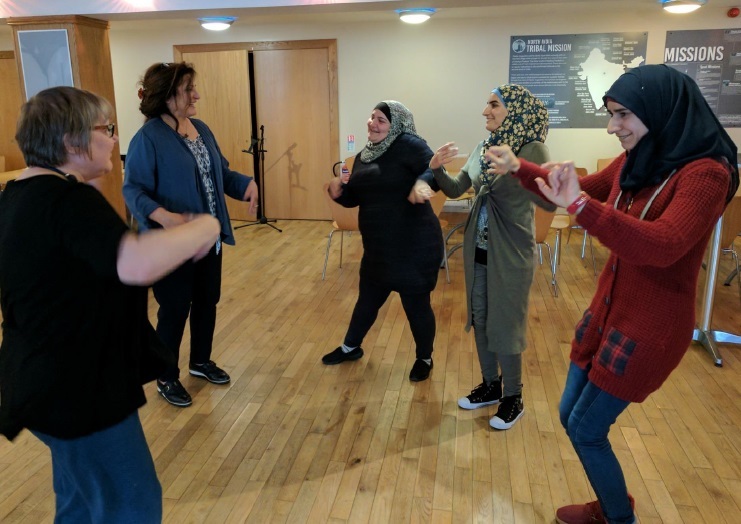 10 Syrian New Scots took part – 3 ladies and 7 men. King’s Community Church hosted us for 7 days of rehearsals – we were joined by two fabulous drama teachers for voice coaching and projection exercises. The final day saw us at Torry Youth & Leisure Centre for a day of recording with SHMU. All participants did amazingly in the studio… we also had help from Margaret who assisted the ladies with their English script and performed the role of a Social Worker. Everyone who took part had an amazing time and the output is currently being edited and mastered in Berlin. Watching the ladies performing and recording in English was really heart-warming – both ladies had literally only been in Scotland for between one and two months – we’re all very proud of their courage to stand in a recording studio and make mistakes so publicly! We’re hoping to broadcast locally with SHMU and develop a community platform for the Syrian New Scots on the local radio. Part Three of the project will also hopefully see us take to the stage. Thanks to The Trojan Women Project – Charlotte Eager and William Stirling; King’s Community Church, Wendy, Margaret, Christine, Murray and Shawn from SHMU for helping to make this happen. 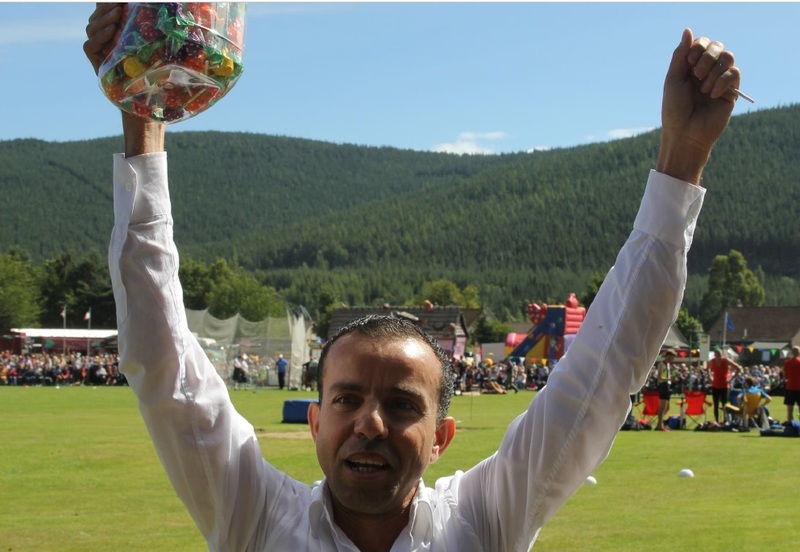 On Thursday last week we took 83 Syrians to the Highland Games in Ballater. It was a spectacularly warm and sunny day and the children and families enjoyed themselves immensely. The Queen unfortunately did not attend… but the families joined in the spirit and took part in races, were mesmerised by the marching pipe bands and witnessed their first caber toss. 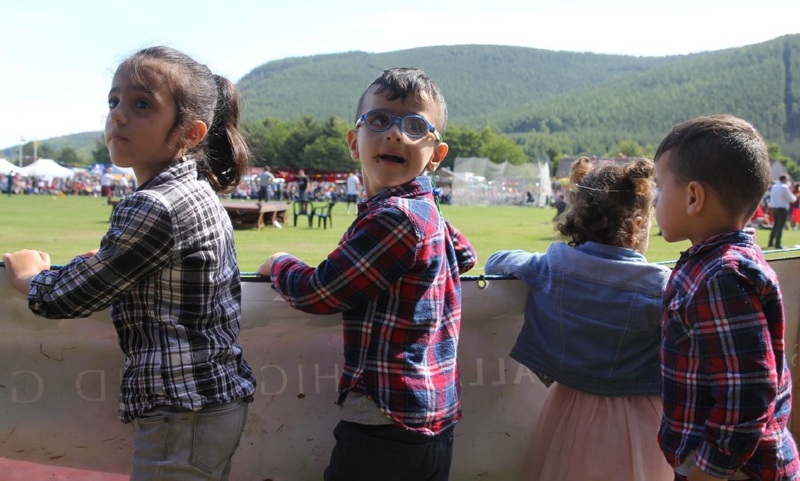 The journey to the Games was just as enjoyable – the children and families were eagerly taking photos of the Scottish countryside and reliably informing myself and the team that Aberdeen and Scotland were more beautiful than Glasgow or London or Lebanon or Turkey (but not Syria)…. We ended the day with a meal all together, all in all, a fantastic time had by all. This trip was funded and supported by the charity Give Them A Sporting Chance. Special thanks again to Rachel Soplantila, Ben Goss OBE and Ron Drever for all their work and support to make this happen. It was so wonderful to be able to get all the families together and give the children something to talk about when they return to school. In this PDF there are a handful of pictures from the rehearsals and recording. I’ve included those that best capture the day . You’ll note a picture of the Bell children handing out beautifully crafted wooden boxes containing Arabic baclava– their father, John Bell, and Gulfsands Petroleum very generously gifted every family with a box of sweets that literally travelled across the world from Syria, to Lebanon, to Heathrow, and finally to Aberdeen. The families will now decide which charity they would like to fundraise for, as part of the reciprocity of benefitting from Give Them A Sporting Chance.